What happens when sponsored children have a heart to help? 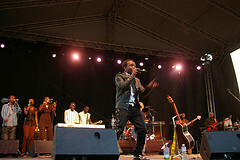 Enric Sifa performs for 80,000 people over two nights in Kigali last summer. With nearly 8,000 street kids in Kigali, Rwanda… a simple act of love has the potential to launch a child living on the streets into a life never dreamed of. To sum it up in four words… hope starts with love. With several of our friends, who themselves, are sponsored children living in Kigali. They have decided that they want to give back. They want to be that reflection of love that ignited a hope in them that has led them to new exciting places and a life filled with opportunities. With this, their act of love simple… bless the street kids with a really nice dinner(many of them get only 1-2 meals a week), a new shirt, music, and a message of hope. To accomplish this, they need our help to make this dream a reality. Join us on 12/19 at Manhattan Cafe in Portland, Oregon from 6-8pm to help make a difference. Plus, an opportunity to listen to the music of Enric Sifa and friends for a FREE concert. We know this is a busy time, but mark your calendars for this special event. Last time, we packed the place out. With Hope starts with Love… let’s do it again. Previous Previous post: Help Spread Awareness and Make a Difference this December….